The Prop Den • ROTJ Stormtrooper HelmetsWhat do we know? ROTJ Stormtrooper Helmets - What do we know? I'm green with envy, T-VIRUS! Very nice helmet. Great thread and great info on the RotJ helmets. They're a different breed all together. It's a shame it doesn't always get the appreciation it deserves. Thanks guys...yeah Jez...they look alot brighter in the pics than in person. Even the tube stripes look off in the photo...probably should have done without the flash. Do you reckon that T-VIRUS' helmet might be an Oakley? Yes - looks a lot like one to me. What's the background on Matizza? I've never heard of it before. Matizza was a friend of Matt G's so I imagine his moulds come from the same source as Matt's which would be the helmet shown in my first post. Matts' ROTJ armour came from the Oakley source IIRC. 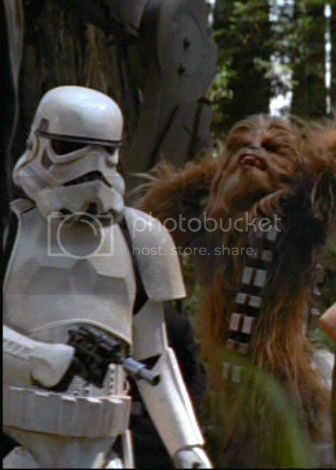 As far as I am aware Matt G's old helmet is the only original ROTJ Stormtrooper helmet that has been cast to date. Looks like Mattiza modified the eyes from the original, the bump has totally gone. Looks a nice helmet none the less. That is correct afaik as well. I really miss mine. Would love to get a replacement some day. I wonder if Matt still has the molds for it? I know of another who has a direct copy from Matts original molds but is pretty much out of the hobby and doesnt do pulls anymore. [That is correct afaik as well. I really miss mine. Would love to get a replacement some day. I wonder if Matt still has the molds for it? I know of another who has a direct copy from Matts original molds but is pretty much out of the hobby and doesnt do pulls anymore. 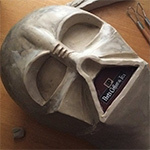 AFAIK Matt sold his ROTJ molds to CRprops and now they're owned by GINO. Yeah thats one of about 5 versions of that story. Guys any more OT info or pics on original helmets used in Jedi? He's holding Solo's blaster. Check the film. The first trooper Han punches out is this guy, so he can get his weapon back.